Believe it or not, there is sound in space. It’s just not the type of sound we’re used to. The sound waves we normally listen to are mechanical waves, which means that they require a medium to pass through (i.e. air). Space is virtually a vacuum, which is why you wouldn’t hear anything if you stuck your head out of a spaceship. The descriptions of those videos do a decent job explaining how those sounds are being generated, so if my brief introduction didn’t satisfy you, I hope the words of others, who have taken the time to find and make these astonishing works available to the public, does. Let’s take a look at the Sun and the Earth. Our planet orbits the Sun. What does this mean? Well, following Newton’s law of universal gravitation, the Sun and the Earth exert a gravitational force over each other. So, it follows that there is some point in space between these two bodies where the gravitational force of the Sun on the Earth will cancel that of the Earth on the Sun. Simple… or is it? There is another force at work: centrifugal. 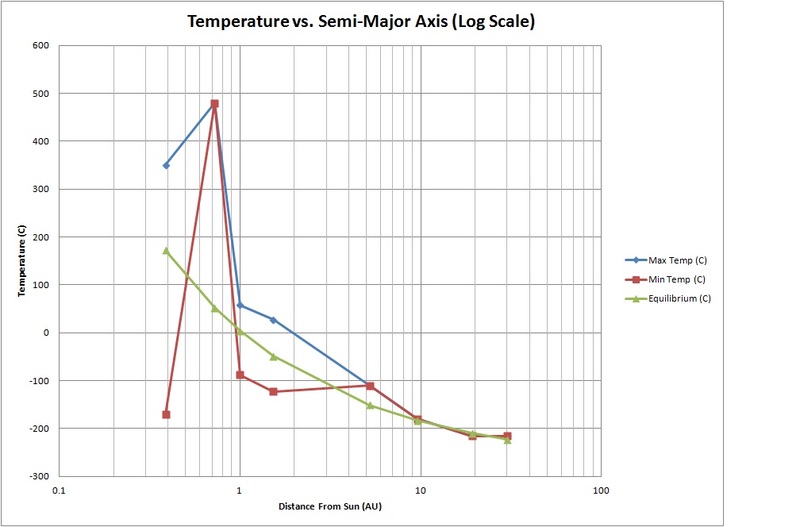 The Sun and Earth orbit a common center of gravity. Any object moving in a circle will experience centrifugal force, i.e. the force that pushes outward. If you’ve ever heard of an amusement park ride called the Gravitron, well, that’s centrifugal force at work. The opposite of centrifugal force is centripetal force, i.e. the force that pushes inwards, and this works to maintain an object’s circular path. To visualize these two forces at work, imagine yourself tying a piece of string to a rock. Now, start swinging that string like a lasso. Centrifugal force is pushing the rock outwards. At the same time, centripetal force is pushing back down the string towards the center of motion (you). Swing the string hard enough and centrifugal force wins the battle against centripetal force (and the tension of the string, which we’ll assume is negligible to keep the example simple), and your rock shoots off tangentially to its former circular path. In the previous scenario, gravity isn’t really an issue, primarily because you and the rock do not exert a significant force on each other with respect to the Earth beneath you. But, when we’re talking about space and orbits, gravity becomes a big deal. The eighteenth-century French-Italian mathematician Joseph Louis Lagrange made an interesting discovery when tinkering with the interplay between gravity and centrifugal/centripetal forces in orbital systems: there exists positions in space where the gravitational pull of the two masses precisely equals the centripetal force required to rotate with them. Specifically, 5 such points exists, and, theoretically, an object sent to any of these points of Lagrange will remain stationary. 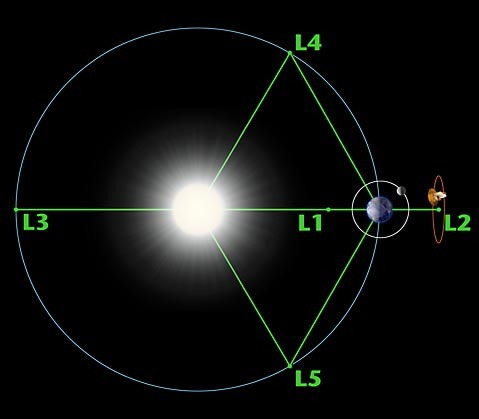 The figure at the top illustrates the 5 Lagrangian points of the Sun-Earth system. Some of these points have already been put to use by astronomers. Point 1 is where you will find the Solar and Heliospheric Observatory, or SOHO. Its position allows it to enjoy an uninterrupted view of the Sun at all times and collect information about the solar wind an hour before it reaches the Earth. At point 2 lies the Wilkinson Microwave Anisotropy Probe, used by astronomers to observe the Cosmic Microwave Background (CMB) and calculate the age of the universe (Weintraub, 2011). Point 2 will also serve as the placement site for the James Webb Space Telescope. Outside of satellite destinations, popular astronomer Neil deGrasse Tyson envisions another use for these points: “… imagine fuel stations at every Lagrangian point in the solar system, where travelers fill up their rocket gas tanks en route to visit friends and relatives elsewhere among the planets. This travel model, however futuristic is reads, is not entirely farfetched. Note that without fueling stations scattered liberally across the United States, your automobile would require the proportions of the Saturn V rocket to drive coast to coast: most of your vehicle’s size and mass would be fuel, used primarily to transport the yet-to-be-consumed fuel during your cross-country trip. We don’t travel this way on Earth. Perhaps the time is overdue when we no longer travel that way through space.” (Tyson, 2007). It’s an interesting thought, to say the least, and, for me, it illustrates how cool physics can be. When you’re not being tested on it. Recently in Astro 201, we learned a bit about the physics of light and how it applies to the instruments we use to view the sky. Over the years, NASA and other space agencies have employed a variety of telescopes and instruments in order to better understand the universe. Of these, perhaps the most famous is the Hubble Space Telescope. The telescope was launched in 1990 and orbits at an altitude of 353 miles, well above the Earth’s atmosphere. This allows it to view the heavens without having to deal with the distortions of light that occur when light travels from space to an observatory on the Earth’s surface. 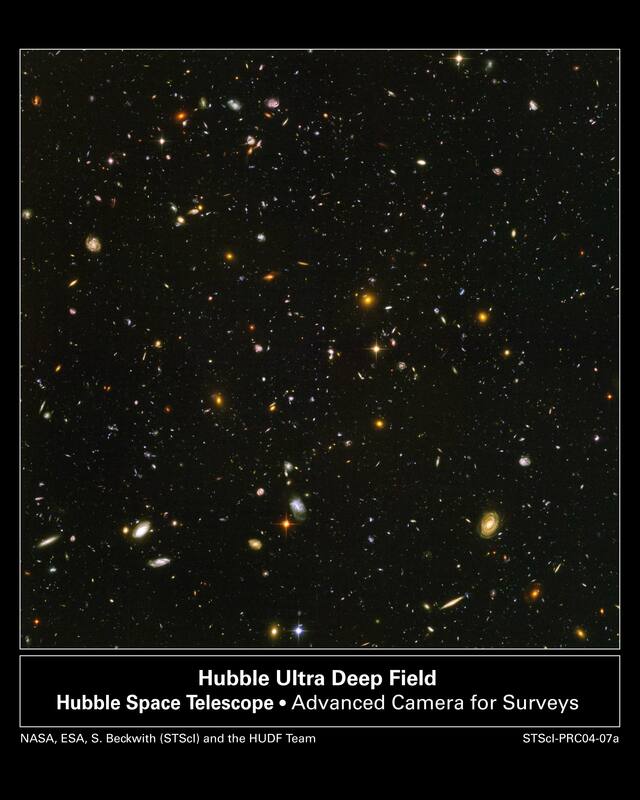 Equipped with instruments that can peer into the far regions of space and take images at optical, infrared, and ultraviolet light wavelengths, the Hubble has been crucial in the advancement of astronomical knowledge over its lifetime (Bennett et al., 2010). 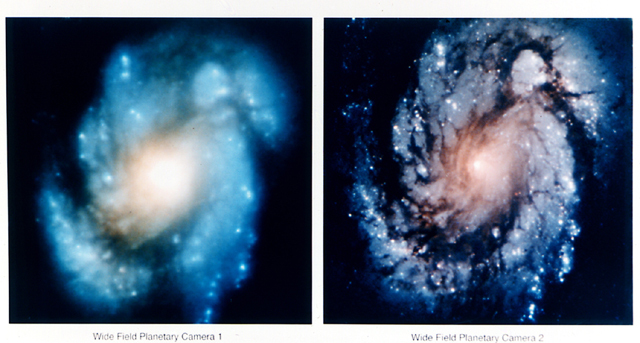 Interestingly, the Hubble Project nearly faced a premature, and disastrous, ending. Just weeks after its launch, the first pictures were relayed back to the astronomers on the ground. They were shocked to see that those images, while better than ones taken by observatories on the ground, were far less pristine than expected. This was the result of Hubble’s primary mirror being slightly misshapen… by about 1/50th the thickness of a sheet of paper. This incredibly small error was enough to throw off the path of light as it entered the telescope, and illustrates how crucial attention to minute details is when dealing with incredibly advanced astronomical technologies. The flaw in the mirror was enough to render the telescope a $1.5 billion sitting duck. 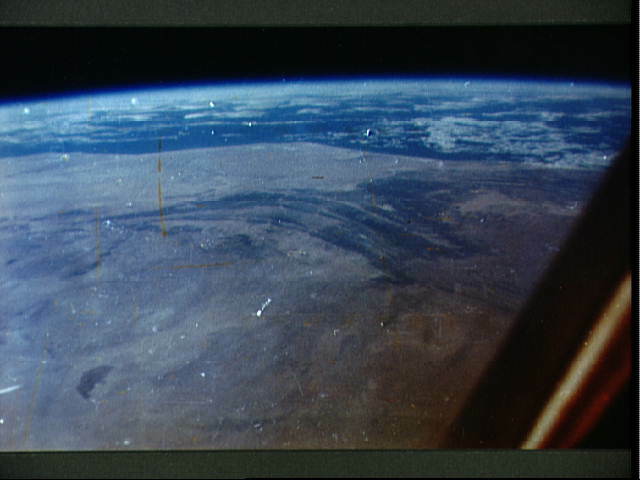 The picture above was taken in Earth orbit by John Glenn during his Mercury-Atlas 6 mission. The mission launched on February 20, 1962 and was a milestone in American space exploration, as Glenn became the first American to orbit the Earth. Glenn’s mission, as with all of the missions that took place during Project Mercury, was instrumental in advancing America’s fledgling space program. It gave the U.S. the chance to catch to catch up to the Soviet Union (who had already put the first satellite, Sputnik, and the first man, Yuri Gagarin, in space) and paved the way for the eventual lunar missions undertaken during Project Apollo. In anticipation of the 50th anniversary of Glenn’s flight, many media organizations have published their own tributes and stories reminiscing on the event. As a space history nerd, I certainly admire Glenn and recognize the importance of his work. However, I also do cringe when I heard the following misconception: “John Glenn was the first American in space!” No, he was not. That distinction belongs to Alan Shepard, pilot of the Mercury-Redstone 3 mission which launched on May 5, 1961. Unlike Glenn’s flight, Shepard’s was suborbital, i.e. the capsule reached space but fell back to Earth before completing an orbit. Still, Shepard’s success is what gave NASA the confidence to go ahead with Glenn’s mission. For those more interested in his flight, the HBO documentary series “From the Earth to the Moon” has a great scene covering it which can be viewed on YouTube. Shepard’s 50th anniversary did not enjoy the level of exposure of Glenn’s (see CNN and ABC). Why was this the case? On May 2, 2011, SEAL Team Six executed Operation Neptune Spear, which resulted in the death of the most wanted terrorist on the planet. Three days later, the media, and the world, was still too enthralled with what had transpired in Abbottabad, Pakistan, to focus on Shepard’s historic flight. In all fairness, can you blame them? Shepard and Glenn mark the moments when Americans made the leap from Earth to space. Coincidentally, their Mercury missions almost became the last missions either astronaut flew. 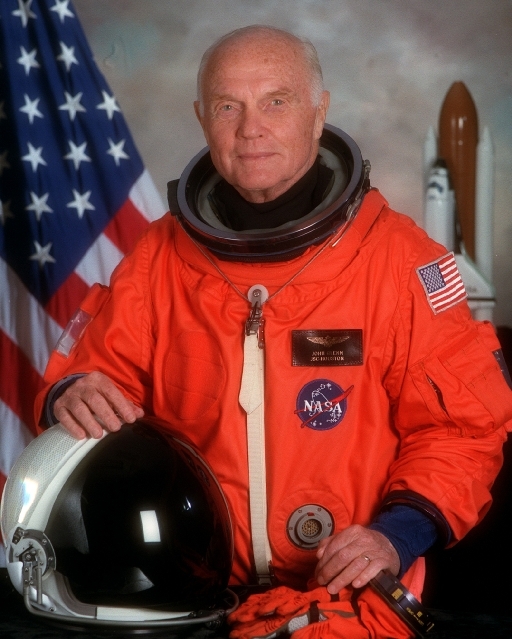 John Glenn retired from NASA and entered politics, serving as a U.S. senator from 1974 to 1999. However, he did take a break and return to NASA, at the ripe old age of 77, to fly on Space Shuttle Discovery mission STS-95 on October 29, 1998. In doing so, he became the oldest man to fly into space. After the completion of Project Mercury, Alan Shepard was selected as commander for the first manned mission of Project Gemini. Unfortunately, he was soon diagnosed with Ménière’s disease and was grounded from space travel. He stayed at NASA, serving as its Chief of the Astronaut Office. After undergoing experimental corrective surgery, Shepard was reinstated to the astronaut pool. 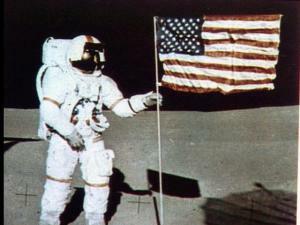 He served as commander on Apollo 14 and became the 5th man to walk on the Moon. While carrying out the scheduled tasks on the lunar surface, he also took the time to hit two golf ball with a makeshift putt, making him the first, and only, person to ever use the Moon as a driving range. For those who are more interested in learning about Glenn and Shepard’s historic flights, I suggest visiting the links at the bottom. The one from NASA is particularly good because one can toggle through multimedia features and explore the other missions of Project Mercury. Johannes Kepler, like Copernicus, put forth a model of the universe (solar system) where the Sun, not the Earth, served as the center. However, contrary to the Copernican model, Kepler’s postulated that these orbits were elliptical, with the Sun located at one of the ellipse’s foci. Along with two other observations, that the radius of an orbit sweeps out equal areas in equal times and that the square of a planet’s orbital period is proportional to the cube of its semi-major axis, Kepler formulated his now-famous laws of planetary motion (Breinig, n.d.). Isaac Newton later studied and improved upon Kepler’s work. For example, using Kepler’s first and second laws, Newton formulated his law of universal gravitation (F = G (m1m2)/r2). 2 major events in astronomical history took place during Kepler’s lifetime. The first occurred on October 17, 1604. This was when Kepler observed a supernova (SN 1604). This event, along with Tycho Brahe’s observations of the supernova of 1572, provided evidence that refuted the then-accepted Aristotelian view of the immutability of the heavens (Vishwanath, 2004). In 1610, Galileo Galilei published the Sidereus Nuncius, which recorded the astounding observations of the heavens he had made with his telescope (i.e. Jupiter and its moons), and sent a manuscript to Kepler (Van Helden, 1989). While Kepler responded to Galileo with support, the views Galileo put forth went against the doctrine of the Catholic Church, foreshadowing Galileo’s future troubles. An influential historical figure in Kepler’s time was the aforementioned Tycho Brahe. Kepler served as an assistant to the Danish astronomer. Brahe is remembered for his incredibly detailed observations of the night sky and planetary motion, unparalleled at the time, and it is Brahe’s work that Kepler would turn to when formulating his three laws. While this overview is brief, what strikes me is Kepler’s lasting influence on Isaac Newton, a man regarded as one of the most influential scientists to ever live. Part of Newton’s magum opus, the Philosophiae Naturalis Principia Mathematica, incorporated Kepler’s work. Kepler’s laws, and Newton’s work on them, are fundamental to the field of astrophysics. Even a brief overview makes one thing very clear: Kepler’s role in the advancement of astronomy, and classical physics, cannot be understated. Breinig, Marianne. (n.d.). Kepler’s Laws. Retreived from http://electron9.phys.utk.edu/phys135d/modules/m8/Kepler.htm. Dutch, Steven. (1998). Copernicus, Kepler, Galileo, Newton. 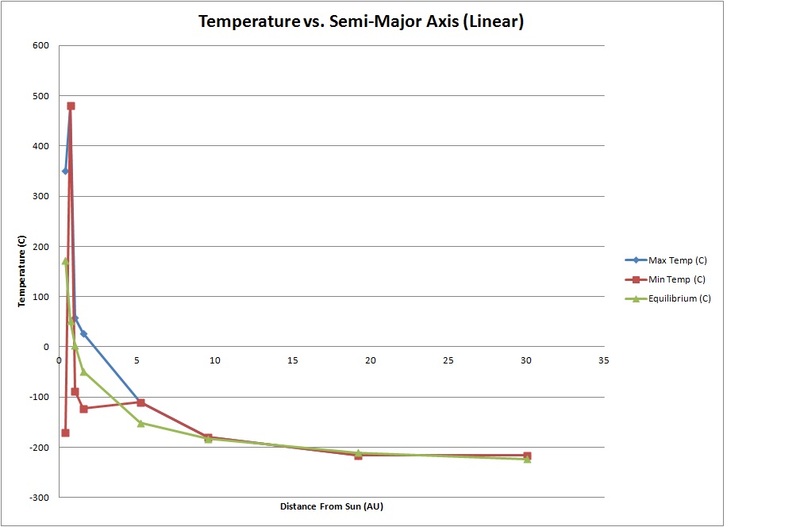 Retrieved from http://www.uwgb.edu/dutchs/westtech/suncentr.htm. Galilei, Galileo. (1989). Siderue nuncius or the sidereal messenger. (A. Van Helden, Trans.). Chicago, IL: University of Chicago Press. (Original work published 1610). Vishwanath, P.R. (2004). Four hundredth anniversary of Kepler’s supernova. Current Science, 87 (7), 1013-1015. I am a history nerd and a science geek. Now that we got that out of the way, it’s pretty understandable why manned space exploration, so steeped in historical and scientific significance, is absolutely fascinating for me. A major topic that incorporates both history and science is the Cold War’s Space Race. On October 4, 1957, the Soviet Union launched the first artificial satellite into space (Sputnik 1). For nearly the next 20 years, the Soviets and the United States took part in a frantic rivalry, with each side dedicated to one-upping the other in attaining a variety of “firsts” in space exploration. I’m sure many of you have seen the image above before. Entitled “Earthrise,” it was taken by the crew of Apollo 8. Frank Borman, James Lovell, and William Anders became the first humans to leave Earth orbit and voyage to the Moon (if the name Jim Lovell sounds familiar, it should. He was the commander of the ill-fated, and now famous, Apollo 13 mission). The picture was taken by Anders while the crew was in lunar orbit on December 24, 1968. For even the casual astronomer or space enthusiast, “Earthrise” is perhaps the most famous picture ever taken. Personally, I don’t know the exact words I can use to describe how I feel and what I think when I see this picture. I guess the best thing I can say is that it’s awe-inspiring, and an eye-opener. Born from a rivalry between 2 superpowers, mankind witnessed an unprecedented leap in technological ability and pushed the horizon of exploration further than previously thought possible, and this picture is a testament to that fact. “Earthrise” also demonstrates the vast and humbling nature of space. That blue sphere surrounded by black emptiness is our home. From a more modern perspective, “Earthrise” invokes something else. Times are tough for our country. A casualty of this period is manned space exploration. With the Space Shuttle in retirement, it’s now back to the drawing board for NASA and other aerospace companies in order to to lead us into the next era in space exploration, whenever that may be. “Earthrise” is a picture I inevitably turn to when I think about the merits of space exploration. Again, it’s just hard to explain. “Earthrise” validates what astronaut Gus Grissom said back during the beginnings of Project Apollo: “The conquest of space is worth the risk of life.” It is worth that risk because what we achieve in the form of knowledge, understanding and, yes, pride outweighs the sacrifices made to obtain it. 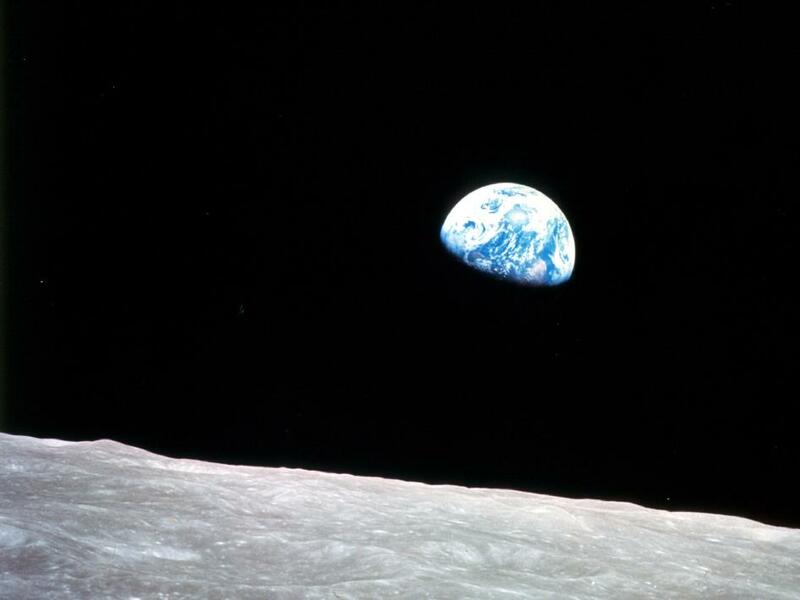 Call me crazy, but “Earthrise” is perhaps the most beautiful thing I’ve ever seen. I’m hopeful that somewhere down the road a new generation of scientists and adventurers decide to carry the torch, just as Lovell, Anders, Borman, Armstrong and others did. I’m hopeful that we once again find individuals eager to expand our horizons and take us to new realms in space. As Neil deGrasse Tyson writes, “Ever since there have been people, there have been explorers, looking in places where others hadn’t been before. Not everyone does it, but we are part of a species where some members of the species do- to the benefit of us all.” (http://www.haydenplanetarium.org/tyson/read/quotes-by-neil-degrasse-tyson/space-exploration-quotes) And I truly can’t wait to see what the next big thing in space exploration has in store for us.